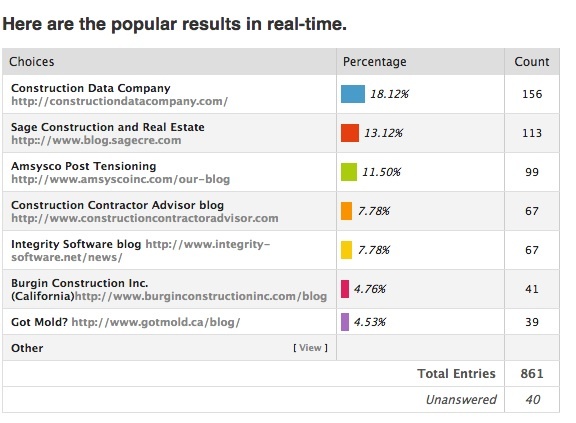 I’ve completed my reviews for the 2014 Best Construction Blog competition. Your votes over the next few weeks will set the course for the finalist judging process. When judging starts in early April, judges can access the popular vote, but focus on other topics including design quality, relevance, frequency of updating, and reliability. The judges vote independently of each other, with a rating system, that allows us to tabulate the best overall blog. Right, now, if you are a blogger or someone who wants a blog to win, please feel free to get out the vote. This is most important if you are on the cusp of getting into the top ranks. You don’t need to be number one in popular vote (though the blog with that status will receive special recognition); just be effective in discovering votes to get to the home page. When you vote, I ask for your name and email address, which are loaded on a special list for this competition. We’ll send you a couple of emails, one as the voting concludes and the second when we announce the finalist. That’s it. We won’t spam you with additional emails. Could CoSchedule help co-ordinate your AEC content marketing systems?